Welcome To Abacus Mental Arithmetic Education Center! For other uses, see Abacus (disambiguation). "Abaci" and "abacuses" redirect here. For the Turkish surname, see Abacı. For the medieval book, see Liber Abaci. 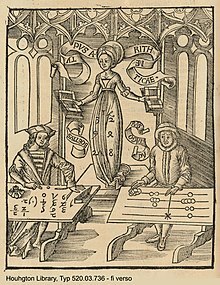 Calculating-Table by Gregor Reisch: Margarita Philosophica, 1503. The woodcut shows Arithmetica instructing an algorist and an abacist (inaccurately represented as Boethius and Pythagoras). There was keen competition between the two from the introduction of the Algebra into Europe in the 12th century until its triumph in the 16th. The abacus (plural abaci or abacuses), also called a counting frame, is a calculating tool that was in use in Europe, China and Russia, centuries before the adoption of the written Hindu–Arabic numeral system and is still used by merchants, traders and clerks in some parts of Eastern Europe, Russia, China and Africa. Today, abaci are often constructed as a bamboo frame with beads sliding on wires, but originally they were beans or stones moved in grooves in sand or on tablets of wood, stone, or metal. The use of the word abacus dates before 1387 AD, when a Middle English work borrowed the word from Latin to describe a sandboard abacus. The Latin word came from Greek ἄβαξ abax which means something without base, and improperly, any piece of rectangular board or plank. Alternatively, without reference to ancient texts on etymology, it has been suggested that it means "a square tablet strewn with dust", or "drawing-board covered with dust (for the use of mathematics)" (the exact shape of the Latin perhaps reflects the genitive form of the Greek word, ἄβακoς abakos). Whereas the table strewn with dust definition is popular, there are those that do not place credence in this at all and in fact state that it is not proven. [nb 1] Greek ἄβαξ itself is probably a borrowing of a Northwest Semitic, perhaps Phoenician, word akin to Hebrew ʾābāq (אבק), "dust" (or in post-Biblical sense meaning "sand used as a writing surface"). The preferred plural of abacus is a subject of disagreement, with both abacuses and abaci in use. The user of an abacus is called an abacist. The period 2700–2300 BC saw the first appearance of the Sumerian abacus, a table of successive columns which delimited the successive orders of magnitude of their sexagesimal number system. Some scholars point to a character from the Babylonian cuneiform which may have been derived from a representation of the abacus. It is the belief of Old Babylonian scholars such as Carruccio that Old Babylonians "may have used the abacus for the operations of addition and subtraction; however, this primitive device proved difficult to use for more complex calculations". The use of the abacus in Ancient Egypt is mentioned by the Greek historian Herodotus, who writes that the Egyptians manipulated the pebbles from right to left, opposite in direction to the Greek left-to-right method. Archaeologists have found ancient disks of various sizes that are thought to have been used as counters. However, wall depictions of this instrument have not been discovered. During the Achaemenid Empire, around 600 BC the Persians first began to use the abacus. Under the Parthian, Sassanian and Iranian empires, scholars concentrated on exchanging knowledge and inventions with the countries around them – India, China, and the Roman Empire, when it is thought to have been exported to other countries. The earliest archaeological evidence for the use of the Greek abacus dates to the 5th century BC. Also Demosthenes (384 BC–322 BC) talked of the need to use pebbles for calculations too difficult for your head. A play by Alexis from the 4th century BC mentions an abacus and pebbles for accounting, and both Diogenes and Polybius mention men that sometimes stood for more and sometimes for less, like the pebbles on an abacus. The Greek abacus was a table of wood or marble, pre-set with small counters in wood or metal for mathematical calculations. This Greek abacus saw use in Achaemenid Persia, the Etruscan civilization, Ancient Rome and, until the French Revolution, the Western Christian world. A tablet found on the Greek island Salamis in 1846 AD (the Salamis Tablet), dates back to 300 BC, making it the oldest counting board discovered so far. It is a slab of white marble 149 cm (59 in) long, 75 cm (30 in) wide, and 4.5 cm (2 in) thick, on which are 5 groups of markings. In the center of the tablet is a set of 5 parallel lines equally divided by a vertical line, capped with a semicircle at the intersection of the bottom-most horizontal line and the single vertical line. Below these lines is a wide space with a horizontal crack dividing it. Below this crack is another group of eleven parallel lines, again divided into two sections by a line perpendicular to them, but with the semicircle at the top of the intersection; the third, sixth and ninth of these lines are marked with a cross where they intersect with the vertical line. Also from this time frame the Darius Vase was unearthed in 1851. It was covered with pictures including a "treasurer" holding a wax tablet in one hand while manipulating counters on a table with the other. The earliest known written documentation of the Chinese abacus dates to the 2nd century BC. The Chinese abacus, known as the suanpan (算盤, lit. "Counting tray", Mandarin suàn pán, Cantonese syun3 pun4), is typically 20 cm (8 in) tall and comes in various widths depending on the operator. It usually has more than seven rods. There are two beads on each rod in the upper deck and five beads each in the bottom for both decimal and hexadecimal computation. The beads are usually rounded and made of a hardwood. The beads are counted by moving them up or down towards the beam. If you move them toward the beam, you count their value. If you move away, you don't count their value. The suanpan can be reset to the starting position instantly by a quick movement along the horizontal axis to spin all the beads away from the horizontal beam at the center. Suanpans can be used for functions other than counting. Unlike the simple counting board used in elementary schools, very efficient suanpan techniques have been developed to do multiplication, division, addition, subtraction, square root and cube root operations at high speed. There are currently schools teaching students how to use it. In the long scroll Along the River During the Qingming Festival painted by Zhang Zeduan (1085–1145 AD) during the Song dynasty (960–1297 AD), a suanpan is clearly seen lying beside an account book and doctor's prescriptions on the counter of an apothecary's (Feibao). The similarity of the Roman abacus to the Chinese one suggests that one could have inspired the other, as there is some evidence of a trade relationship between the Roman Empire and China. However, no direct connection can be demonstrated, and the similarity of the abaci may be coincidental, both ultimately arising from counting with five fingers per hand. Where the Roman model (like most modern Korean and Japanese) has 4 plus 1 bead per decimal place, the standard suanpan has 5 plus 2. (Incidentally, this allows use with a hexadecimal numeral system.) Instead of running on wires as in the Chinese, Korean, and Japanese models, the beads of Roman model run in grooves, presumably making arithmetic calculations much slower. Another possible source of the suanpan is Chinese counting rods, which operated with a decimal system but lacked the concept of zero as a place holder. The zero was probably introduced to the Chinese in the Tang dynasty (618-907 AD) when travel in the Indian Ocean and the Middle East would have provided direct contact with India, allowing them to acquire the concept of zero and the decimal point from Indian merchants and mathematicians. The normal method of calculation in ancient Rome, as in Greece, was by moving counters on a smooth table. Originally pebbles (calculi) were used. Later, and in medieval Europe, jetons were manufactured. Marked lines indicated units, fives, tens etc. as in the Roman numeral system. This system of 'counter casting' continued into the late Roman empire and in medieval Europe, and persisted in limited use into the nineteenth century. Due to Pope Sylvester II's reintroduction of the abacus with very useful modifications, it became widely used in Europe once again during the 11th century This abacus used beads on wires, unlike the traditional Roman counting boards, which meant the abacus could be used much faster. Writing in the 1st century BC, Horace refers to the wax abacus, a board covered with a thin layer of black wax on which columns and figures were inscribed using a stylus. One example of archaeological evidence of the Roman abacus, shown here in reconstruction, dates to the 1st century AD. It has eight long grooves containing up to five beads in each and eight shorter grooves having either one or no beads in each. The groove marked I indicates units, X tens, and so on up to millions. The beads in the shorter grooves denote fives –five units, five tens etc., essentially in a bi-quinary coded decimal system, obviously related to the Roman numerals. The short grooves on the right may have been used for marking Roman "ounces" (i.e. fractions). There is no clear evidence for use of the abacus in India. The decimal number system invented in India replaced the abacus in Western Europe. The Abhidharmakośabhāṣya of Vasubandhu (316-396), a Sanskrit work on Buddhist philosophy, says that the second-century CE philosopher Vasumitra said that "placing a wick (Sanskrit vartikā) on the number one (ekāṅka) means it is a one, while placing the wick on the number hundred means it is called a hundred, and on the number one thousand means it is called a thousand". It is unclear exactly what this arrangement may have been. Around the 5th century, Indian clerks were already finding new ways of recording the contents of the Abacus. Hindu texts used the term śūnya (zero) to indicate the empty column on the abacus. In Japanese, the abacus is called soroban (算盤, そろばん, lit. "Counting tray"), imported from China in the 14th century. It was probably in use by the working class a century or more before the ruling class started, as the class structure did not allow for devices used by the lower class to be adopted or used by the ruling class. The 1/4 abacus, which is suited to decimal calculation, appeared circa 1930, and became widespread as the Japanese abandoned hexadecimal weight calculation which was still common in China. The abacus is still manufactured in Japan today even with the proliferation, practicality, and affordability of pocket electronic calculators. The use of the soroban is still taught in Japanese primary schools as part of mathematics, primarily as an aid to faster mental calculation. Using visual imagery of a soroban, one can arrive at the answer in the same time as, or even faster than, is possible with a physical instrument. The Chinese abacus migrated from China to Korea around 1400 AD. Koreans call it jupan (주판), supan (수판) or jusan (주산). A yupana as used by the Incas. Some sources mention the use of an abacus called a nepohualtzintzin in ancient Aztec culture. This Mesoamerican abacus used a 5-digit base-20 system. The word Nepōhualtzintzin [nepoːwaɬˈt͡sint͡sin] comes from Nahuatl and it is formed by the roots; Ne - personal -; pōhual or pōhualli [ˈpoːwalːi] - the account -; and tzintzin [ˈt͡sint͡sin] - small similar elements. Its complete meaning was taken as: counting with small similar elements by somebody. Its use was taught in the Calmecac to the temalpouhqueh [temaɬˈpoʍkeʔ], who were students dedicated to take the accounts of skies, from childhood. The Nepōhualtzintzin was divided in two main parts separated by a bar or intermediate cord. In the left part there were four beads, which in the first row have unitary values (1, 2, 3, and 4), and in the right side there are three beads with values of 5, 10, and 15 respectively. In order to know the value of the respective beads of the upper rows, it is enough to multiply by 20 (by each row), the value of the corresponding account in the first row. Altogether, there were 13 rows with 7 beads in each one, which made up 91 beads in each Nepōhualtzintzin. This was a basic number to understand, 7 times 13, a close relation conceived between natural phenomena, the underworld and the cycles of the heavens. One Nepōhualtzintzin (91) represented the number of days that a season of the year lasts, two Nepōhualtzitzin (182) is the number of days of the corn's cycle, from its sowing to its harvest, three Nepōhualtzintzin (273) is the number of days of a baby's gestation, and four Nepōhualtzintzin (364) completed a cycle and approximate a year (11/4 days short). When translated into modern computer arithmetic, the Nepōhualtzintzin amounted to the rank from 10 to the 18 in floating point, which calculated stellar as well as infinitesimal amounts with absolute precision, meant that no round off was allowed. The rediscovery of the Nepōhualtzintzin was due to the Mexican engineer David Esparza Hidalgo, who in his wanderings throughout Mexico found diverse engravings and paintings of this instrument and reconstructed several of them made in gold, jade, encrustations of shell, etc. There have also been found very old Nepōhualtzintzin attributed to the Olmec culture, and even some bracelets of Mayan origin, as well as a diversity of forms and materials in other cultures. George I. Sanchez, "Arithmetic in Maya", Austin-Texas, 1961 found another base 5, base 4 abacus in the Yucatán peninsula that also computed calendar data. This was a finger abacus, on one hand 0, 1, 2, 3, and 4 were used; and on the other hand 0, 1, 2 and 3 were used. Note the use of zero at the beginning and end of the two cycles. Sanchez worked with Sylvanus Morley, a noted Mayanist. The quipu of the Incas was a system of colored knotted cords used to record numerical data, like advanced tally sticks – but not used to perform calculations. Calculations were carried out using a yupana (Quechua for "counting tool"; see figure) which was still in use after the conquest of Peru. The working principle of a yupana is unknown, but in 2001 an explanation of the mathematical basis of these instruments was proposed by Italian mathematician Nicolino De Pasquale. By comparing the form of several yupanas, researchers found that calculations were based using the Fibonacci sequence 1, 1, 2, 3, 5 and powers of 10, 20 and 40 as place values for the different fields in the instrument. Using the Fibonacci sequence would keep the number of grains within any one field at a minimum. The Russian abacus, the schoty (счёты), usually has a single slanted deck, with ten beads on each wire (except one wire, usually positioned near the user, with four beads for quarter-ruble fractions). Older models have another 4-bead wire for quarter-kopeks, which were minted until 1916. The Russian abacus is often used vertically, with wires from left to right in the manner of a book. The wires are usually bowed to bulge upward in the center, to keep the beads pinned to either of the two sides. It is cleared when all the beads are moved to the right. During manipulation, beads are moved to the left. For easy viewing, the middle 2 beads on each wire (the 5th and 6th bead) usually are of a different color from the other eight beads. Likewise, the left bead of the thousands wire (and the million wire, if present) may have a different color. As a simple, cheap and reliable device, the Russian abacus was in use in all shops and markets throughout the former Soviet Union, and the usage of it was taught in most schools until the 1990s. Even the 1874 invention of mechanical calculator, Odhner arithmometer, had not replaced them in Russia and likewise the mass production of Felix arithmometers since 1924 did not significantly reduce their use in the Soviet Union. The Russian abacus began to lose popularity only after the mass production of microcalculators had started in the Soviet Union in 1974. Today it is regarded as an archaism and replaced by the handheld calculator. Learning abacus makes you understand the concept of numbers and improves your mental arithmetic skills and basic arithmetic ability in a short period of time. Basically, math is limited to the area of the left brain responsible for logic languages. However, abacus arithmetic stimulates the visual, auditory and tactile without exception and actively helps the development of the right brain responsible for the artistic and sensory abilities as well as the left brain. Agility -Since learning the abacus moving your fingers, you have agility. Number sense - Because you have excellent sense in number, you will show a remarkable ability in mathematics and life calculations.